Diligent is a leading software provider that delivers corporate governance solutions to board members, company secretaries and other leadership team members. The company serves an international client base and 40% of the Fortune 100, with major offices in New York, Washington DC, Vancouver, London, Munich, Sydney and Christchurch. In an exclusive interview with Leaders League, Diligent CEO Brian Stafford outlines the company’s services, strategy and the benefits of using governance software. Can you tell us about Diligent and what the company does? Diligent is the leading provider of board governance software for organizations around the globe. The business has north of $200 million in revenue, with 14,000 clients and around 450,000 users who rely on our applications throughout the year to access their secure materials and collaborate. We have a pretty wide global footprint, more than half of our clients and revenue are outside of the US, and our products are used by 70% of the FTSE 100 and leading organizations all across Europe. What is board governance software? We operate a very intuitive and simple application for board members to receive, comment, annotate and collaborate on their board materials. On top of the basic board meeting requirements, we offer a series of governance tools that help digitize processes well beyond the boardroom including secure communications, conflict questionnaires, board evaluations, and subsidiary management. 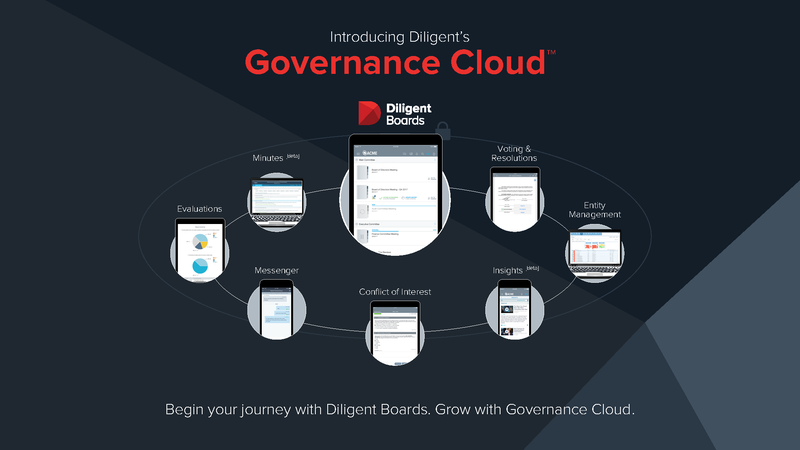 These are just a few pieces of the Governance Cloud – our centralized suite of secure digital tools that help governance leaders ask better questions, gain deeper insight, and add value across the full scope of governance responsibilities. What is the benefit of using your dedicated governance software over a company’s pre-existing internal systems? Most board members are not full-time employees of their company, so technically they sit outside the company’s firewall. Many of the tools that a company has, such as corporate email addresses and mobile device management software, simply don’t apply to board members because they are not full-time employees. However, companies typically end up sending them some of the most sensitive and confidential corporate information – such as data on executive compensation, M&A plans, layoffs, drug pipeline approval, etc. – which should not be distributed outside of the business. Companies typically email or physically send those materials or put them in a folder for board members to download to their own devices – which means that after the information leaves the company, the company no longer has control over it. A busy board member, who might be running through the airport to catch a plane, might for instance accidentally leave their bag or laptop or iPad behind. Now that information is theoretically available to anyone who gets access to those materials, which is of material risk to the company. We are able to encrypt content on Diligent Boards and block login access on that device. We offer a security and compliance tool, but also one with very easy, simple to use features that can make their lives a lot easier. How do you manage cybersecurity risk? We offer industry leading cybersecurity and controls, it’s at the heart of who we are as a business. All of our clients have gone through and tested our security to make sure they’re comfortable with distributing their sensitive materials through our applications. All the files are encrypted and all the materials are sent to and reside in secure data centers and our own secure hardware – which is more secure than using other cloud-based applications. Do you target the biggest organizations, or do you also work with mid-market companies? Both – we work with anyone who is worried about their sensitive materials getting out into the public. Let’s say you’re a mid-market industrial company, if you’re emailing your documents around and one of your directors is using a free email service provider, those documents are at risk as all of those free email service providers have been hacked or are susceptible to other people viewing your information. Your current clients are mostly corporates, will you also be targeting other businesses or geographies? We’re primarily used by leading corporates, but also governments as well. We do think there’s an opportunity to move into working with law firms and more generally into the legal tech sector. We also think there’s a material opportunity throughout Europe and continental Europe in particular. Our largest office globally is actually in London, but we’re looking at establishing additional offices over continental Europe. What role do you feel software-as-a-service providers have in improving business’ corporate governance strategies? We think that software has a material role in improving corporate governance. One of the top issues for most boards is cybersecurity and cyber risk, so we believe there is a material opportunity for boards to set the right tone and set the right example for the rest of the company. One of the ways they can set that example is by using secure tools for the consumption and management of the board materials – so they’re not just telling the organization that it should be more secure, instead they’re actually taking steps to own a part of that solution and doing it for themselves. The adoption of services like this is a little bit ahead in the US, but we’re seeing these tools adopted in Europe more and more. If companies want to practice good governance, they really need to use the tools like Diligent’s to help them do that. Good governance is our business. At Diligent we are here to help leaders with simple and streamlined enterprise governance management software that makes governance easier. As the role and responsibilities of the board of directors grows, we promise to grow with them, adapt and respond with innovative and integrated solutions. Our flagship product, Diligent Boards, is the most widely used board portal in the world, relied on by more than 400,000 board directors in 12,000 organisations around the globe. We’re proud to claim that Diligent holds the highest client retention rate in the industry, at 98.8%.